Can you believe we’re already beginning the Third Week of Lent? Sometimes it passes so quickly that it’s over before you find your Lenten “groove”. As we approach the midway point of this season it’s a good time to re-evaluate our Lenten practices. Have we been faithful to prayer, fasting, and almsgiving thus far? Do we need to make some changes – either step things up a notch, or dial them down because we’ve set up unrealistic expectations? 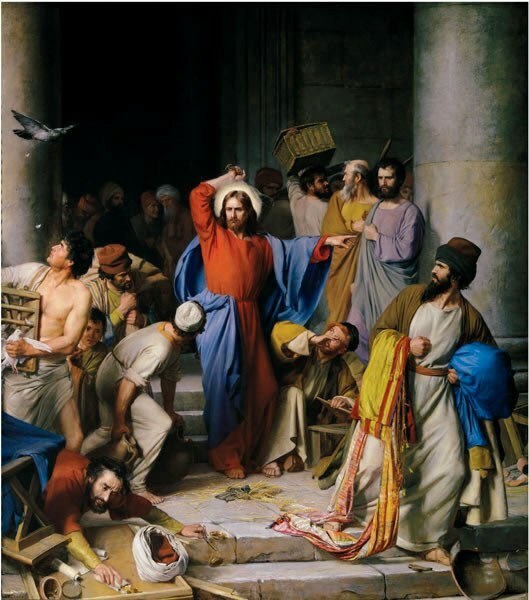 Today’s Gospel today presents the episode of the expulsion of the vendors from the temple (Jn 2: 13-25). Jesus ‘made a whip out of cords and drove them all out of the temple, with the sheep and oxen’ (Jn 2:15), the money, everything. This gesture aroused strong reactions, in the people and in the disciples. Clearly, it appeared as a prophetic gesture, to such an extent that some of those present asked Jesus, ‘What sign can you show us for doing these things?’ Who are you to do these things. Show us that you have the authority to do them. They were looking from a sign from God, that shows Jesus as being sent by God. And He answered, “Destroy this temple, and in three days, I will raise it up” (v. 19). In this Lenten season, we are preparing for the celebration of Easter, when we renew the promises of our Baptism. We walk into the world as Jesus did and we make our whole existence be a sign of His love for our brothers, especially the weakest and the poorest. We build a temple to God in our lives. And so, we make him “meet-able ” to the many people we find along our path. But, we ask ourselves and each of us may wonder: Does the Lord feel truly at home in my life? Do we allow Him to do a “cleansing” in our hearts and to drive out the idols, those attitudes of greed, jealousy, worldliness, envy, hatred, that habit of gossiping and tearing down others? Each Eucharist, we celebrate with faith. It makes us grow as a living temple of the Lord, through Communion with his Body, crucified and risen. Jesus knows what is in each of us, and knows even our most ardent desire: that to be inhabited by him, only by Him. Holy Mary, privileged dwelling place of the Son of God, accompany and sustain us this Lent, so that we can rediscover the beauty of the encounter with Christ, which frees us and saves us. I extend a cordial welcome to the faithful of Rome and all the pilgrims from various parts of the world. I greet the faithful of Curitiba, Brazil; parish groups of Treviso, Genoa, Crotone, L’Aquila and from the area of ​​Domodossola. A special thought goes to the young boys from Garda, who received Confirmation. During Lent, we try to stay closer to the people who are going through difficult times, to our neighbors, with affection, prayer and solidarity. Today, March 8th, I salute all the women who daily work to build a more human and welcoming society. And a fraternal thank you to those that in thousands of ways witness the Gospel and work in the Church. And this is, for us, an opportunity to reaffirm the importance and the necessity of their presence in life. A world where women are marginalized is a barren world, because women not only bring life, but send us the ability to see beyond, see beyond them, They send us the ability to understand the world through different eyes, to hear things with more creative, more patient, more tender hearts. A prayer and a special blessing for all women present here in the square and for all women! A greeting! I wish you all a good Sunday. Do not forget, please, to pray for me. Good lunch and goodbye! This entry was posted in Lent, Pope Francis and tagged Jesus, Lent, Pope Francis, Sunday Angelus Address by texasnuns. Bookmark the permalink.